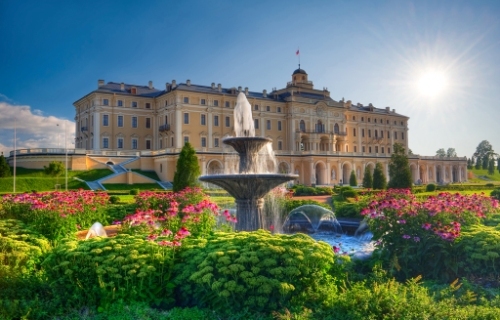 Strelna is one of the magnificent Imperial estates surrounding St Petersburg. 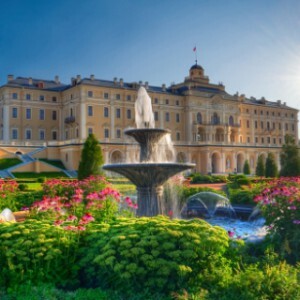 Strelna is located halfway between Saint Petersburg and Peterhof, overlooking the Gilf of Finland. The natural beauty of the place attracted a number of the Russian royalty starting with Peter the Great. He wanted his summer residence located in the place and commissioned one of the best architects of the time to design the palace and the park, but the project had not been completed for a long time. The place turned out to be ill-adapted for installation of fountains, so Peter the Great turned his attenntion to Peterhof. The palace was completed only when the place was granted to Great Duke Constantine Pavlovich, and is still known as Constantine Palace. In the Soviet period the place fell into decay, and the restoration started in 2001, when it was turned into the Presidential Residence and a state conference center. The Palace and the park with canals, fountains and drawbridges was recreated to the original designs of Peter the Great’s time.